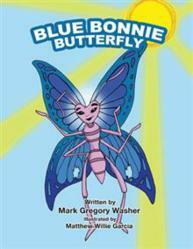 In the new children’s book “Blue Bonnie Butterfly” (published by Trafford Publishing), by Mark Gregory Washer, children find a whimsical bedtime story with a few lessons hidden within the rhymes. Bonnie learns an important lesson: when you get knocked down, you have to get right back up. Washer wrote “Blue Bonnie Butterfly” to be different from most other children’s books. In it, lessons are approached much more directly, making for easier understanding. The characters are obviously different from each other, and they learn to cope with each others’ differences and live the life they’ve been given. Blue Bonnie Butterfly and Tanya the Two-Tailed Turtle are friends; they frolic together, learning about life, and discover common issues that even young readers will be able to identify with. Their reactions offer children likely examples of the best ways to approach and deal with adversity. Mark Gregory Washer loves the way a young child looks at him when he answers their questions. He believes that, early and often, children need to hear lessons about life. It is the duty of a parent to reinforce positive messages throughout the day. Washer offers lessons concerning strength of character and freedom of the spirit, found in educational tales to broaden vocabulary and challenge the mind to imagine what could be. A proud godfather, Washer has found that as he teaches children he learns more from them. They learn the lessons of life together. Washer works as a mechanic at a tire factory in Topeka, Kansas. He has always dreamed of writing books for children.